Do you remember your baptism? Who was there? What happened? Do you still have your certificate and candle? What do you do on the anniversary of your baptism? You will need two paper plates per dove, scissors, pens, hole punch, double sided sticky tape (or glue, if you prefer), small bits of paper, some lengths of wool (about 12-18 inches if fine), and a plain piece of card to make the template. You might also like to pre-print some pieces of paper (or stickers) with the wording taken from the scripture passage – see photo. Leave a dotted line for the name of the child to be written in by hand. 1. Draw on a paper plate the outline of a dove, so that the tips of the wings and the tail benefit from the crimping round the edge of the plate, but the head and the belly are entirely on the flat bit of the plate. 2. Now, make another dove, facing the other way, so you can stick the two doves back to back, with the wings and tail fanning out, as in the picture. Try it, and you’ll hopefully see what I mean. 3. Use double sided tape to stick each pair of doves together. You will need one small strip at the bottom of the belly, one between the body and tail, and one at the neck. Don’t stick the back or the wings together. 4. Gently bend the wings apart. Use the hole punch to make a hole at the top of the wing, as close as you can to the balance point (the balance point on mine was towards the back of the top of the wing). Tie each end of the wool through one of the holes, so you have a loop to hang up the dove. 5. Stick on the sticker of piece of paper with the wording on it, and write your own name on the dotted line. Talk about how God also loves us, not as a reward for what we have done, but because we are his children. 6. You should end up with a sort of ‘pocket’ between the wings of the dove. This is where your small pieces of paper come in. You can write or draw something (as many as you like) to remind them of blessings, encouragements, and gifts you have received without earning them – remembering that the words that God the Father spoke to Jesus weren’t a reward for what he’d done (because he hadn’t done anything yet!) but were spoken out of pure love, and to give Jesus strength and encouragement for all that he would go on to do. Post the bits of paper into the pocket in the back of the dove – you can pray a thank you prayer as you do this. 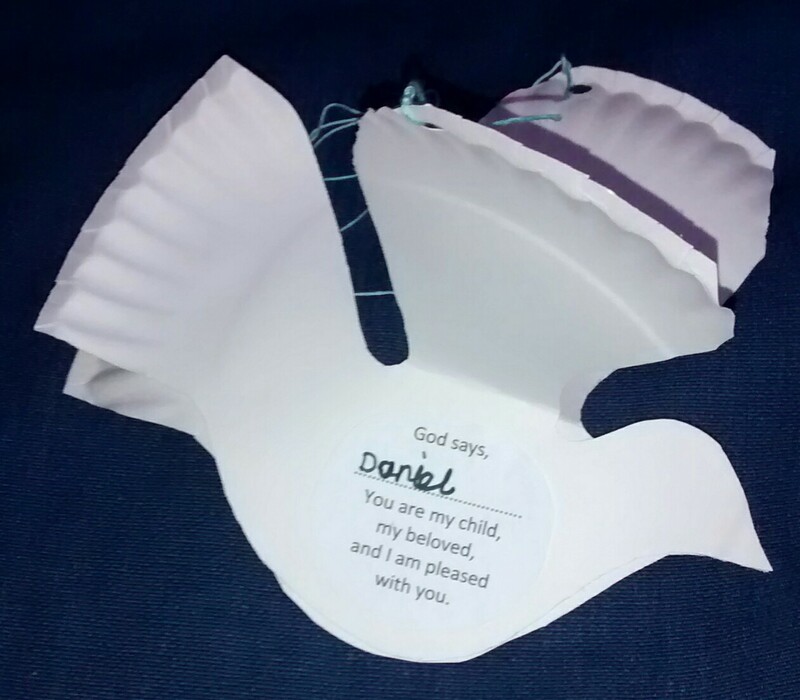 This dove makes a great gift for a child who is being baptised. Write their name on the dotted line, and on the small pieces of paper write some ‘blessings’ or gifts that you think God might want to give them. Things like love, wisdom, happiness, family, health etc may be suggested. These words can be made into a prayer for the child being baptised as the dove is presented to them.